Mick McCarthy at today's announcement. Why’s the squad so big? IF YOU THOUGHT the naming of bloated provisional squads was solely the preserve of the previous regime, you’re wrong. McCarthy named a 38-man squad today, featuring fully five goalkeepers (although Caoimhin Kelleher will be with the U21s at the start of the camp so will only be available for the Georgia game). The manager will then whittle that squad down to a 23-man panel by St Patrick’s Day, as the training camp begins the following day. One of the reasons his initial selection is so large is because it’s the first. There’s also a pragmatism to naming such a big squad with another round of club fixtures to go ahead: if an injury to a key player pushes in someone from the periphery of the squad, their presence in a provisional squad makes it easier to include them. Many of you won’t know this, but when the majority of the already-sparse crowd fled for the bars and toilets at half-time of the Northern Ireland game in November, Glenn Whelan was subject to a presentation to thank him for his international service. The stadium was barely a quarter-full at that point: proof that even the reward for his best work goes unseen. While that was supposedly Whelan’s final game for Ireland, his retirement lasted a single game. There is no guarantee that Whelan will make the final squad for this double-header, but McCarthy did speak of how he offers Ireland a rare option at defensive midfield. There are a few other returning faces: David McGoldrick is back after finding himself out in the cold under O’Neill, and Keiren Westwood likewise; Stephen Ward returns, too, as does Aiden McGeady. The Sunderland winger hasn’t played for Ireland since the 5-1 Episode against Denmark, which he curiously ended as a defensive midfielder. Given the recent fare, there are very few Irish fans similarly afflicted today. Of the 38 players in McCarthy’s squad, just 13 are currently playing with a Premier League club. Of that group, two – Mark Travers and Caoimhin Kelleher – are yet to make a senior appearance for their clubs, while Stephen Ward has made one league appearance this season, which is one more than James McCarthy has made thus far this year. It’s a considerable dilution of the quality available to McCarthy: of the 14 players he used in his final game in charge, for example, all but two played in England’s top flight. Of the eight strikers included in today’s squad, by contrast, only Shane Long is playing in the Premier League. Ronan Curtis and James Collins are playing in League One, while Padraig Amond supplements his FA Cup heroics with a day job in League Two. McCarthy bristled, however, at the suggestion that he is now picking a lower standard of player. I think that’s a little unfair to call them a lower standard of players. I’m talking about players who are playing at their level and are scoring goals. I don’t think that can be easily dismissed. Patrick Bamford isn’t in this squad, although having declared his interest in switching allegiances, he may be included in the next squad in June. Will Keane, meanwhile, is injured and nonetheless still ineligible. Nathan Redmond has yet to declare an interest, while Liam Kelly – who stepped away from Martin O’Neill’s selection a year ago – has yet to show any inkling pointing to a return. While some think the recruiting of players is an unseemly business, McCarthy won’t be stopping anytime soon. McCarthy also believes that any potential recruits will not have a negative impact on the dressing room. “Not at all. No. I’ve been in the dressing room when it’s happened, and I’ve actually walked into the dressing room and taken somebody’s place who was born in Ireland. Who is out of contention? Given the size of the squad, there are very few fixtures of previous O’Neill squads absent this time around. Jon Walters, Michael Obafemi, Ciaran Clark, and Callum Robinson are all out injured, although the latter has returned to training and if he plays for Preston this weekend he may yet be a late call-up. Colin Doyle, Greg Cunningham, and Darragh Lenihan were regulars in O’Neill squads who failed to make the cut this time, while the manager confirmed that he has scouted Kieran Sadlier but he hasn’t yet done enough to wrestle his way into contention. Oh, also missing from previous O’Neill squads is Decl- ah, we’re done with that. 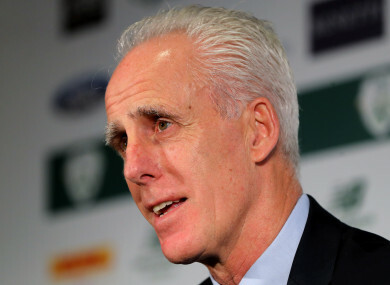 Email “5 talking points from the first squad announcement of Mick McCarthy's second reign”. Feedback on “5 talking points from the first squad announcement of Mick McCarthy's second reign”.